Yuengling Oktoberfest is one of the finest Marzen beers brewed on this side of the Atlantic Ocean. Marzen, the official un-official Oktoberfest beer, is full-bodied, rich, toasty and dark copper in color. 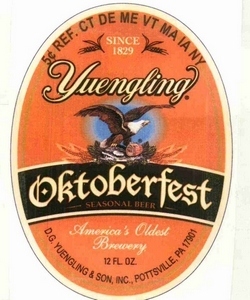 Think Yuengling reliablity and affordability meets German brewing skill and Oktoberfest flavor. It’s frickin delicious! This entry was posted in Newly Added Beers! by kennettbeverage. Bookmark the permalink.